« Corporate Sponsored Pothole Repair! 2. Using striking visual imagery to relate to our environment, question our social and political agendas through serendipitous moments, and ambiguous gestures, such as those of artist Shepard Fairey, are old hat. What we need from our street artists are active political gestures which shape thinking and disseminate ideas, as opposed to create confusion in hopes of shaking things up.Â Do you agree? 3. Jenifer Jacobs has fun at CBS’s expense and maybe you should too. She says, “My art is an effort to take responsibility for the effects of my exposure to popular media and provide an insightful and personal response.” Amazing, most of us just let it wash over us like a cool breeze. 4. Illegal billboards are everywhere but it’s always fun to catch them when they are feeling out new teritory. Brooklyn isnt as popular as Manhattan but in this economy, companies are scoping out some new spots across the river. 5. I love how building owners and outdoor advertising companies feign ignorance of both the penalties and the laws regarding outdoor advertising signage. Perhaps this $955,000 fine might help educate the industry, or bettter, eventually drive them all out of business. This entry was posted in News and tagged nyc, the law. Bookmark the permalink. Post a comment or leave a trackback: Trackback URL. 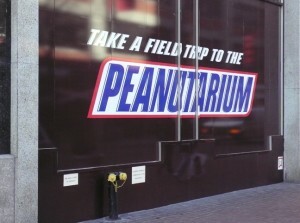 With that peanut-salmonella scare, I’d be leary of going into the peanutarium. How exactly do you find out if the outdoor advertisements are indeed illegal? Is there some website or other resource that could be used to find if billboards are illegal in other large cities?